Turkey and the EU strike a refugee deal. The EU and Turkey’s Refugee Deal Is Good for the EU and Turkey. Not So Much for Refugees. 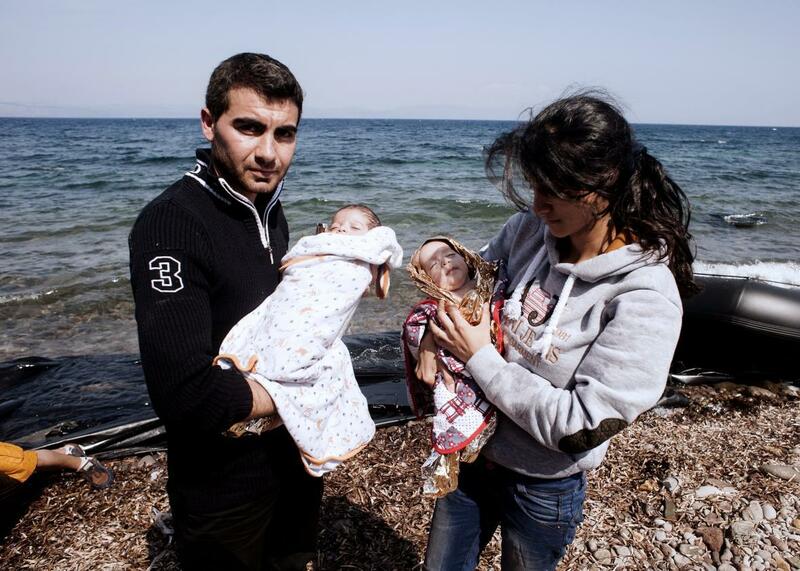 A refugee couple from Syria pose with their twin babies on Eftalou Beach, west of the port of Mytilene, on the Greek island of Lesbos after crossing the Aegean Sea from Turkey on Sept. 21, 2015. The EU and Turkey reached a deal on Sunday under which Turkey will take steps to slow the flow of migrants into southern Europe in exchange for aid and renewed talks on EU membership. Unfortunately the deal, which may lead to more migrants being stuck in already overburdened Turkey, probably won’t do that much to address the refugee crisis. Critics are comparing it to Europe’s old arrangement with Muammar Qaddafi’s dictatorship to keep African migrants out of Europe. With the EU still unable to reach a political agreement that would accommodate the record number of refugees and migrants entering the continent—expected to hit 1.5 million this year—and a humanitarian disaster looming with the arrival of winter, EU leaders are desperate to have transit countries outside the EU do more to halt the influx. Under the new agreement, struck in Brussels, Turkey will step up border checks and naval patrols to prevent unauthorized migrants from traveling through to Europe. In exchange, Turkey will get $3.2 billion in aid to help accommodate the more than 2 million displaced Syrians living in the country. If the new border controls are successful, many Turks may also benefit from visa-free travel to the EU and the deal promises a “re-energized” negotiating process on Turkey’s entry into the EU. Talks over Turkey’s entrance into the EU began more than a decade ago but have mostly stalled. There are concerns in European capitals about President Recep Tayyip Erdogan’s increasingly autocratic rule, crackdowns on political dissent, and renewed fighting between the Turkish government and Kurdish groups, including some of the ones fighting ISIS. There are also some less high-minded concerns in Europe about the cultural differences between Muslim Turkey and Europe and the prospect of Turkish workers entering the European labor market. Despite Sunday’s deal, a real agreement on membership seems pretty far off. Just last month, Erdogan had dismissed the idea of a deal like this as “bribery,” saying that if Europe wanted his help to stop the crisis, nothing less than full membership would do. The Turkish position evidently softened after some aggressive lobbying from German Chancellor Angela Merkel and the EU aid offer being lifted from $2.3 billion to $3 billion. I’d also bet that Turkey is more interested in forging closer ties with Europe now that relations with Russia have dramatically worsened following the shooting down of a Russian jet by Turkish forces last week. Prime Minister Ahmet Davutoglu stuck to his guns in Brussels on Monday, dismissing the idea that Turkey should apologize for what it views as a legitimate defense of its airspace from Russian incursion. Just as Russia’s seizure of Crimea and support for separatist rebels in Eastern Ukraine have pushed Kiev even closer to Europe, the breakdown in Turkish-Russian relations, which seemed to be improving not so long ago, could potentially help Ankara and Brussels iron out their differences. Vladimir Putin’s grand plan to expand Russia’s regional influence is hitting some snags.